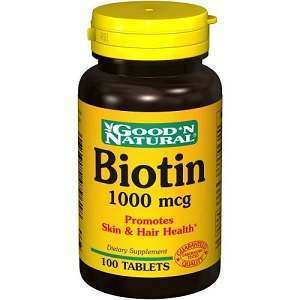 We will be reviewing Good ‘n Natural Biotin. This is a product for consumers who are looking to boost and support healthy skin, hair, and nails. The supplement also aids in maintaining a healthy metabolism. Keep reading to see if this is a supplement that is meant for you. Other ingredients include: Dicalcium Phosphate, Vegetable Cellulose, Silica, Vegetable Magnesium Stearate. The manufacturer also makes sure to state this product is a vegetarian/vegan formula on the product’s label. There are no traces of: gluten, yeast, wheat, milk/milk derivatives, lactose, soy, egg, corn, grapefruit, fish, sweetener, sugar, starch, preservatives, artificial color/flavor, or sodium. For the average adult, the manufacturer recommends 1 to 5 tablets daily. They should be consumed with meals. There are no specific side effects listed. However the product does warn that women who are pregnant or nursing should first consult with a doctor before use. They also state that if any adverse reactions or side effects do occur, to discontinue use and seek out a doctor. This is not meant for children and should only be consumed by adults over the age of 18. This is a low priced dietary supplement. While it is not sold directly from the manufacturer’s website, authorized online sellers are selling this product at a low price of $3.88. The reason perhaps the price is so low for this product is due to the fact it only contains one essential ingredient, which is biotin. If it were a multi-vitamin or a supplement with various ingredients, the price would be higher and perhaps more expensive. There is no literature to provide any information about a money back guarantee for the customer. However, online retailers do provide a disclaimer that those who try the product and are not satisfied do have the ability to return the product for a full refund. While it is slightly disconcerting there is no information about customer satisfaction on the website, the potential consumer does have the ability to contact the manufacturer directly with any questions or concerns. There are positive reviews about the product left on the authorized online sellers sites, which can give the potential consumer necessary feedback about whether the product is ideal. Good ‘n Natural Biotin is an affordable supplement for those who are looking to boost the health of their hair, skin, and nails. It is also ideal for those who want a vegetarian or vegan supplement option. However, this is not ideal for those who are looking for a supplement that covers various health concerns nor does it replace the potential consumer’s multi-vitamin. It is also slightly alarming there is no literature about a customer guarantee on the manufacturer’s website itself; however, the positive reviews may persuade the consumer to bypass this fact. If you are looking to incorporate another supplement into your daily dietary vitamin routine, this is an affordable option for you. John Brownstone	reviewed Good 'n Natural Biotin	on July 28th	 and gave it a rating of 2.5.